Click here for Japanese Version "Midori". New Features and Updated Citations in new 4th Edition of Health Program Planning: An Educational and Ecological Approach, New York: McGraw-Hill, 2005. In their 3rd edition in 1999, Green and Kreuter added dimensions of health promotion planning from their international experience in Canada, Europe, China, Australia, Singapore, Japan, and Africa. Translations of the 2nd edition into Chinese and Japanese, and condensed versions in French and Spanish, had reached wider audiences of practitioners, researchers and policy makers who produced a growing list of published applications of the model. They also collaborated with Robert Gold and Nancy Atkinson to produce the EMPOWER software described below, and to add a chapter on technology applications of the Precede-Proceed model to the book. Following the 3rd edition, Laura A. Linnan, ScD, and her colleagues conducted in 2001 a survey of the 253 universities offering graduate or undergraduate degree specialization in health education, determining that the Precede-Proceed Model was taught by 88% of respondents, used by 85.7% in teaching, and used by 74.6% in practice, the most among 10 planning models listed. The respondents also ranked PRECEDE-PROCEED highest among the 10 planning models on usefulness for research (86%), and usefulness for practice (90.8%). Linnan also served as a consultant to Green & Kreuter in their preparation of the 4th edition (2005). The goals of the model are to explain health-related behaviors and environments, and to design and evaluate the interventions needed to influence both the behaviors and the living conditions that influence them and their consequences. This model has been applied, tested, studied, extended, and verified in over 960 published studies and thousands of unpublished projects in community, school, clinical, and workplace settings over the last decade. Click here to view a listing of the published applications of the model. The Precede-Proceed framework for planning is founded on the disciplines of epidemiology; the social, behavioral, and educational sciences; and health administration. Throughout the work with Precede and Proceed, two fundamental propositions are emphasized: (1) health and health risks are caused by multiple factors and (2) because health and health risks are determined by multiple factors, efforts to effect behavioral, environmental, and social change must be multidimensional or multisectoral, and participatory. The Precede-Proceed Model is the framework around which Green and Kreuter teamed with Robert Gold, now Dean of the College of Health and Human Performance at the University of Maryland, to build EMPOWER (CD-ROM software and manual) to provide technical guidance and assistance to those involved in the complex process of planning and implementing community-level cancer prevention and control interventions. This system, EMPOWER (Enabling Methods of Planning and Organizing Within Everyone's Reach), begins with the recognition that program planning encompasses many complex skills, techniques, and data from a variety of fields. An educational version of EMPOWER, designed to teach the components of Precede-Proceed, is now available for sale from Jones and Bartlett Publishing Company. Click here to access ordering information from Jones and Bartlett. Green, L.W. and Kreuter, M.W. 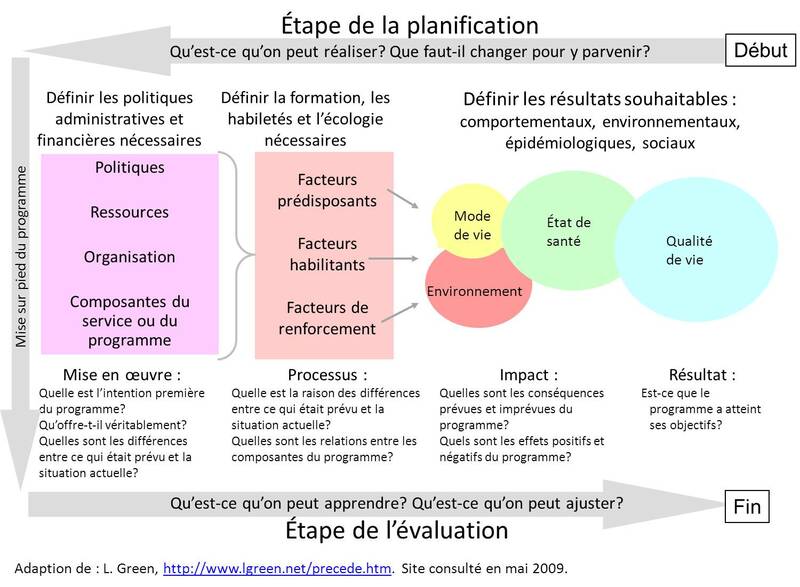 Health Program Planning: An Educational and Ecological Approach. 4th edition. NY: McGraw-Hill Higher Education, 2005. Green, L.W. and Kreuter, M.W. Health Promotion Planning: An Educational and Ecological Approach, 3rd edition (Mayfield Publishing was purchased by McGraw-Hill in 2001; for the catalog description of this book and to order a review copy, to obtain copyright permissions to reprint from it, to identify sales agents outside the U.S. or your camps representative, go to: McGraw-Hill. Green, L.W., & Kreuter, M.W. Health Promotion Planning: An Educational and Environmental Approach, 2nd edition (Palo Alto: Mayfield Publishing Co., 1991). Green, LW, et al. 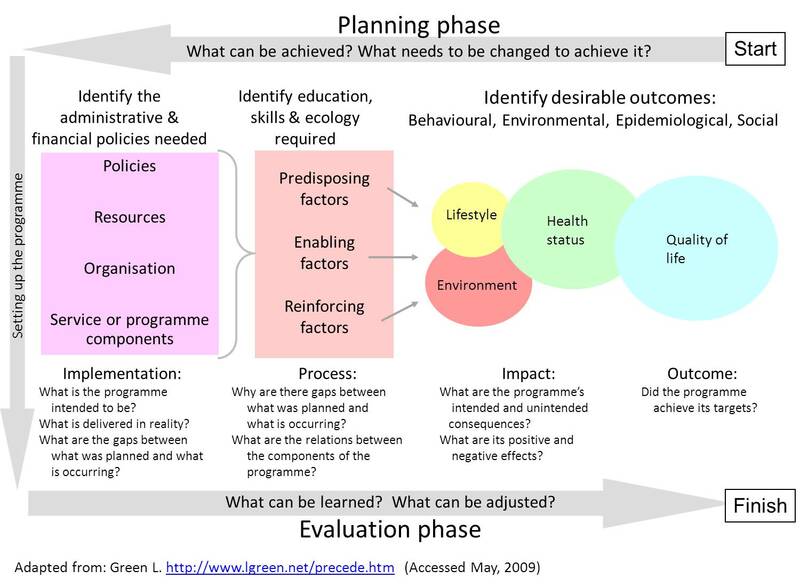 Health Education Planning: A Diagnostic Approach. Palo Alto, CA: Mayfield Publishing Co., 1980. Green, L.W., Kreuter, M. W. (1992). CDC's Planned Approach to Community Health as an application of PRECEDE and an inspiration for PROCEED. Journal of Health Education 23: 140-147. Click here for the complete CDC manual for use of the PATCH guidelines and procedures for planning and evaluating a community health program. Kreuter, M.W., Lezin, N., Kreuter, M., Green, L.W. Community Health Promotion Ideas That Work, 2nd edition. Boston, Toronto, London, Singapore: Jones & Bartlett Publishers, 2003. Ottoson, J. M., & Green, L. W. (2001). Public health education and health promotion. In L. F. Novick, & G. P. Mays (Eds.). Public health administration: Principles for population-based management. (Pp. 300-323). Gaithersburg, MD: Aspen Publishers, Inc. 2nd edition in press (2006). Click here for a videotape of the satellite broadcast of September 12, 2002 by the Agency for Toxic Substances and Disease Registry (ASTDR), "Working with Communities for Environmental Health" in which Dr Kreuter and others discuss how the PRECEDE-PROCEED model applies to planning community environmental health programs.